Right one week after our first BJJ intensive Camp in Munich/Germany we are heading north to Belgium!!! For the first time we are going to have our IX. 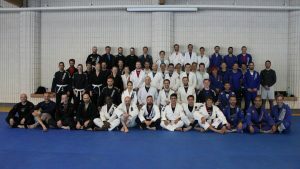 BJJ intensive Camp in Oostende/Belgium. Brazilian Jiu Jitsu is growing all over the world. This allows all practitioners to train wherever they go. 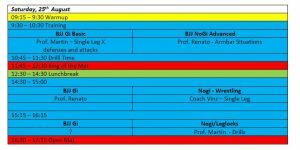 The problem is that you have to decide which part of the Art of Brazilian Jiu Jitsu you want to improve at. Is it Self-defense, Sport Jiu Jitsu, Nogi, Grappling for MMA. 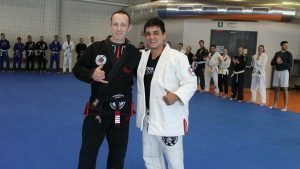 When BJJ was founded they trained for all aspects but now BJJ has grown so much that for example Sport BJJ is totally different than Grappling for MMA. This means you have to have specialists in all fields and that one instructor cannot cover all aspects anymore. Check out our last camps and you can see that we are running 2 classes at the same time. BJJ for Beginners, BJJ for Advanced Students, Nogi, Leglocks, Grappling/Wrestling for MMA, Self defense classes. If we have Professor or Coaches available we also could offer Judo, Woman only classes, Kickboxing or Conditioning. 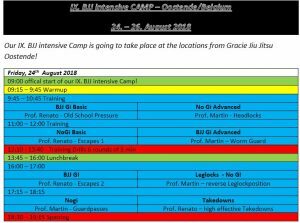 For more info about the classes please check out the schedule which is going to be released a few weeks before the camp. Not included: Accommodation neither food – you have to take care of it by yourself!